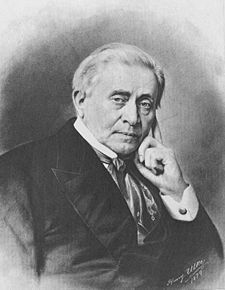 Joseph Henry (December 17, 1799 – May 13, 1878) was a Scottish-American scientist whose inventions and discoveries in the fields of electromagnetism and magnetic induction helped launch the age of electrodynamics. Henry served as First Secretary of the Smithsonian Institution, which he shaped into the organization it is today. 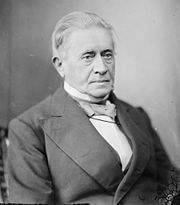 Joseph Henry was born on December 17, 1799, in Albany, New York, the son of Ann Alexander Henry and William Henry, both of whom were Scottish immigrants. Henry was sent to live with his grandmother in Galway, Saratoga County, New York, when he was seven. His father died a few years later. From the age of ten, he worked at a general store, and attended school in the afternoons. While living in Galway, he accidentally stumbled upon the village library, and from a perusal of its collection developed a keen interest in literature. When he was 14, he moved to Albany to live with his mother, and worked for a brief time as an apprenticed silversmith, where he developed practical skills that later proved helpful in designing equipment for his experiments. Joseph’s first love was theater, and he came very close to becoming a professional actor. He joined a local theater group called the Rostrum, for which he wrote plays and created set designs. Once, while ill for a few days and confined to the house, he picked up a book left by a boarder, Popular Lectures on Experimental Philosophy, Astronomy and Chemistry, by G. Gregory. This book so inspired him that he soon gave up stage management, and, in 1819, entered The Albany Academy, where he was given free tuition. To make ends meet, he supported himself by teaching and tutoring. He then left the academy to prepare for a career in medicine, but in 1824, he was appointed an assistant engineer for survey of a State road being constructed between the Hudson River and Lake Erie. From then on, his interests switched to a career in engineering. Henry excelled at his studies, to the extent that he often helped his teachers teach science. In 1826, he joined the Albany Academy as an assistant instructor. Two years later, he was appointed Professor of Mathematics and Natural Philosophy by the principal of the Academy, T. Romeyn Beck. Henry's curiosity about terrestrial magnetism led him to experiment with magnetism in general. In 1827, he read his first paper, "On some modifications of the electro-magnetic apparatus." He was the first to coil insulated wire tightly around an iron core in order to make an extremely powerful electromagnet, improving on William Sturgeon’s electromagnet, which used loosely coiled uninsulated wire. Using this technique, he built the most powerful electromagnet at the time for Yale. He also showed that, when making an electromagnet using just two electrodes attached to a battery, it is best to wind several coils of wire in parallel, but when using a set-up with multiple batteries, there should be only one single long coil. The latter arrangement made the telegraph feasible. In 1829, Henry discovered the property of self inductance in a spool of wire, a phenomenon that was discovered independently by Michael Faraday a few years later. Henry did not publish his results, however, until after Faraday had published his in 1834, and thus the discovery is generally credited to Faraday. Once Henry realized that Faraday's work had already been published, he always credited Faraday with the discovery. Henry married Harriet L. Alexander in 1830. The couple had a son and three daughters who survived early childhood. In 1831, Henry created one of the first machines to use electromagnetism for motion. This was the earliest ancestor of the modern DC motor. It did not make use of rotating motion but was merely an electromagnet perched on a pole, rocking back and forth. The rocking motion was caused by one of the two leads on both ends of the magnet rocker touching one of the two battery cells, causing a polarity change, and rocking the opposite direction until the other two leads hit the other battery. Henry also developed a mechanism for sending a signal through a mile of electrical wire that rang a bell. Based on his accomplishments in the fields of electricity and magnetism, through which he had obtained widespread fame, in 1832, Henry was invited to join the College of New Jersey, later named Princeton University, as professor of Natural Philosophy. While at Princeton, he discovered that an electrical current could be induced from one coil to another in a separate circuit, and that the coils could be separated by a large distance without stopping the effect. He also found that he could alter the current and voltage induced in a secondary coil by changing the number of windings in the coil. What is perhaps one of Henry's most remarkable discoveries was the oscillatory nature of a current produced by an electric coil joined to a Leyden jar. A Leyden jar is a simple device: A glass jar with a conductor on both the outside and the inside. The inner conductor is merely a chain that hangs from a stopper at the top of the jar. The stopper also insulates the chain from the jar. The other conductor is a metal coating on the outside of the jar, usually near its base. A charge can be stored in a Leyden jar, and discharged at will by connecting the inside and outside conductors. Henry found that when he discharged the Leyden jar through a coil of wire, an oscillating current was produced. This is precisely the mechanism that was used to transmit radio waves by Heinrich Hertz some 50 years later. Around this time, Henry also invented an electrical relay switch, which was activated by turning an electromagnet on and off. In 1837, Henry traveled to Europe, where he met Charles Wheatstone, who was busy developing a telegraph, as well as many noted scientists on the Continent, including Jean-Baptiste Biot, Francois Arago, A.C. Becquerel, Joseph Louis Gay-Lussac, and Auguste-Arthur de la Rive. He also lectured at the annual meeting of the British Association for the Advancement of Science in Edinburgh. In the late 1830s, Henry and Samuel F.B. Morse, inventor of the telegraph, carried on a brief correspondence, and Henry encouraged Morse, saying that Morse's invention was quite different from mechanisms with a similar aim that had been developed in Great Britain and Europe. He did mention, however, that Morse's invention lacked a method of transmitting electrical signals over long distances. Morse was awarded a patent for some of his inventions in 1840. In a later patent dispute in 1849, Henry was asked to testify as an expert witness. Morse, however, took exception to some of Henry's testimony, believing that it challenged his priority as inventor of the telegraph. Morse issued a pamphlet in 1855, defending his position and asserting the independence of his invention from Henry's work. This dispute was inflamed by supporters on both sides. As a result, a rift developed between the scientist and the inventor (Copp and Zanella 1993, 31-32). This did not prevent Henry from recommending approval of an extension of Morse's patent in 1856 (Dickerson 1885, 63-64). It can be argued that Henry solved the problem of transmitting an electrical effect through a wire over long distances as early as 1835, and of translating that effect into one of greater power at its destination through a relay switch, all of which are important characteristics of an electromagnetic telegraph. He, however, never patented a device based on this technology, because he believed it a violation of pure scientific research to do so (Dickerson 1885, 32-52). In 1829, James Smithson, a wealthy Englishman, bequeathed a large sum to the government of the United States to establish an institution for "the increase and diffusion of knowledge among men…" (Youmans 1896, 361). At first, the government was at a loss as to how to carry out this request, but by 1846, a board of regents had been formed to implement Smithson's wishes. After consulting Henry about how the board might proceed, Henry so impressed the members with his ideas that in December of the same year they elected him secretary of the Smithsonian Institution thus formed. Henry remained at this post for the remainder of his life. In fact, so strongly did he hold to his commitment to the institution that he turned down a professorship at the University of Pennsylvania and the presidency of Princeton. He organized the Smithsonian as the primary center for the publication of original scientific work and for communication of the results of research worldwide. It was his goal to ensure that the Smithsonian's efforts did not duplicate what other government agencies were already doing. The Smithsonian's first publication was issued in 1848—Ancient Monuments of the Mississippi Valley, edited by Ephraim G. Squier and Edwin H. Davis. In 1852, Henry was appointed a member of the Lighthouse Board, and in 1871, became its president. His research demonstrated that lard would be a more effective fuel for lighting than whale oil, which had been used up to that time and was becoming prohibitively expensive. While administrative tasks dominated most of his time after his appointment, Henry still found time for research. In 1848, he worked in conjunction with Professor Stephen Alexander to determine the relative temperatures for different parts of the solar disk. They determined that sunspots were cooler than the surrounding regions. This work was shown to the astronomer Angelo Secchi who extended it, but with some question as to whether Henry was given proper credit for his own earlier work. Henry developed a thermal telescope with which he made observations of clouds, and performed experiments on capillary action between molten and solid metals. He also made important contributions to the science of acoustics. In 1863, Henry co-founded the National Academy of Sciences. He became the organization's second president in 1868. As a famous scientist and director of the Smithsonian Institution, he received visits from scientists and inventors who sought his advice. Henry was patient, kindly, self-controlled, and gently humorous. He was introduced to Prof. Thaddeus Lowe, a balloonist from New Hampshire who had taken interest in the phenomena of lighter-than-air gases, and exploits into meteorology, in particular, the high winds which called the jet stream today. It was Lowe's intent to make a transatlantic crossing via an enormous gas-inflated aerostat. Henry took a great interest in Lowe's endeavors, so much as to support and promote him among some of the more prominent scientists and institutions of the day. At the onset of the Civil War, Lowe, with Henry's endorsement, presented his balloon-based innovations in Washington, and subsequently served the Union forces as a balloonist. Another inventor Henry took an interest in was Alexander Graham Bell who on March 1, 1875, carried a letter of introduction to Henry. Henry showed an interest in seeing Bell's experimental apparatus and Bell returned the following day. Henry advised Bell not to publish his ideas until he had perfected the invention. On June 25, 1876, Bell's experimental telephone was demonstrated at the Centennial Exhibition in Philadelphia, where Joseph Henry was one of the judges for electrical exhibits. On January 13, 1877, Bell demonstrated his instruments to Henry at the Smithsonian Institution and Henry invited Bell to show them again that night at the Washington Philosophical Society. Henry praised "the value and astonishing character of Mr. Bell's discovery and invention." In December 1877, Henry suffered an attack of nephritis, which resulted in partial paralysis. He was able to sustain the effects of the disease until May 13, 1878, the day of his death, having remained coherent and intellectually sound of mind to the end. He was buried in Oak Hill Cemetery in northwest Washington, D.C.
Joseph Henry's grave in Oak Hill Cemetery, Washington, DC. 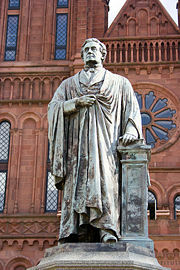 A statue of Joseph Henry standing outside the Smithsonian Institution in Washington, DC. Henry has the unique position of having contributed not only to the progress of science, but also through his role as first secretary of the Smithsonian Institution, to the dissemination of its results. The Smithsonian continues to function as one of America's major research and educational institutions. He came very close to inventing both telegraphy and radio. Certainly his discoveries led the way to long-distance transmission of electrical impulses that made the telegraph possible. Although his experiments in sending impulses through the air did not attract major attention at the time, these too could have led to some significant breakthrough in technology, had not the burden of his other responsibilities prevented it. Although he is often credited with making contributions that made the invention of the telegraph practical, his failure to publish in a timely fashion, and to take out patents on important technology generated needless controversy. Perhaps this was inevitable, as Henry probably deserves the credit he is often given. He conveyed his discoveries to Wheatstone, who was developing a telegraph, as early as 1837, and possibly to Morse in 1839, before Morse was granted his patent. In the case where a scientist is given a task that takes away from research in his major field, one often wonders if more could have been accomplished had the scientist been given the freedom to follow their bent of mind. However, it may be that tasks often viewed as distractions bring balance to a life, just as an argument can be made that a scientist without a family can be more productive, although this can obviously be shown not to be the case. Certainly Henry made a conscious choice to take on the presidency of the Smithsonian rather than devote himself entirely to pure research. His work lives on in his scientific discoveries and in the institutions he helped establish. ↑ Acoustic Dimensions, Joseph Henry's Experiment. Retrieved November 25, 2007. ↑ Robert V. Bruce, Bell: Alexander Graham Bell and the Conquest of Solitude (Ithaca: Cornell University Press, 1990), pages 139-140. ↑ Robert V. Bruce, Bell: Alexander Graham Bell and the Conquest of Solitude (Ithaca: Cornell University Press), page 214. Coulson, Thomas. 1950. 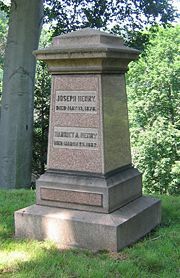 Joseph Henry: His Life and Work. Princeton: Princeton University Press. Dickerson, E. N. 1885. Joseph Henry and the Magnetic Telegraph. New York: C. Scribner's Sons. Henry, Joseph. 1886. Scientific Writings of Joseph Henry. Volumes 1 and 2. Washington, D.C.: Smithsonian Institution. Henry, Joseph and Joseph Sweetman Ames. 1900. The Discovery of Induced Electric Currents. Memoirs Vol. 1. New York: American Book Company. Shaffner, Tal. P. 1855. The Morse American Telegraph: Prof. Henry's Attack and Prof. Morse's Defense. Shaffner's Telegraph Companion Devoted to the Science and Art of the Morse American Telegraph. New York: Pudney & Russell. Taylor, William B. 1880. A Memoir of Joseph Henry: A Sketch of His Scientific Work. Washington, DC: U.S. Govt. Print Off. Youmans, William Jay. 1896. Joseph Henry: 1799-1878. In Pioneers of Science in America: Sketches of Their Lives and Scientific Work. New York: D. Appleton. All links retrieved June 7, 2018. Published physics papers—On the Production of Currents and Sparks of Electricity from Magnetism and On Electro-Dynamic Induction (extract). Biographical details—Proceedings of the National Academy of Sciences (1967), 58(1), pages 1-10. This page was last modified on 7 June 2018, at 19:00.